Imagine you are implementing a new enterprise-wide CRM system. Is it better to send a whole lot of messages out explaining the wonderful rationale behind the new technology? Or does it make more sense to motivate employees to use the new technology by increasing the rewards for when they do and creating negative consequences for when they don’t? Hmmm, when we put it like that the answer is actually quite easy. The only way to change behavior is to change the Reinforcements. Sure, you can talk about a change until you are blue in the face. But, the truth of the matter is…if you don't change the Reinforcements, you simply will not get behavior change. That is why, one of the key elements of the Accelerating Implementation Methodology (AIM) change management methodology is to develop a Reinforcement Strategy. The over-riding principle is simple. Every time you see a behavior, there either is or was a reward for it. This is based on a fundamental principle of human behavior that says people follow the Reinforcement. By following the key AIM principles of Reinforcement, and by applying them tactically throughout a change on an ongoing basis, Change Agents will be much more likely to get the desired behaviors sustained for the long-haul. But remember, Reinforcement management is less about the formal compensation and performance management systems and much more about the interaction between a Sponsor and his or her direct reports on a daily basis. We know people will change their behavior more quickly when there are positive rewards for the desired behavior, balanced with negative consequences for failing to change. You can't expect people to be motivated to make the leap to the unknown unless there is a strong motivation to do things in the new way. One of the most common questions we get from Change Agents as well as Sponsors, is what they should use to Reinforce new behaviors. The first piece of advice we always give during our change management certification programs is all Reinforcements need to be from the Frame of Reference of the individual. In other words, the Reinforcement must have meaning or value for the individual or group you are trying to motivate. Not sure what that is? Then, you need to ask! AIM’s Targeted Reinforcement Tool can help your Sponsors and Change Agents identify which specific rewards will be meaningful for the Targets of your change. 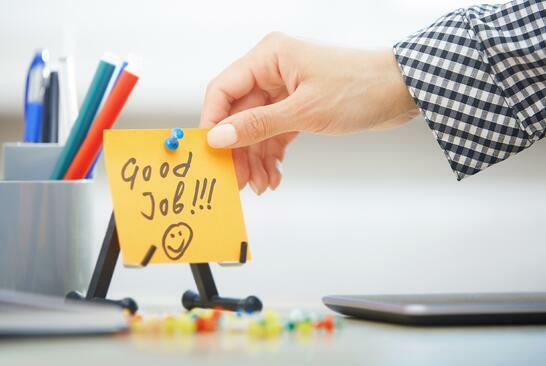 This tool is designed to promote open and frank discussion about Reinforcement between the manager and his or her direct report. Sometimes the results of a Targeted Reinforcement Analysis can be pretty surprising! In one organization, the most significant Reinforcement turned out to be the opportunity to select some logo merchandise. In another, it was having photos of the best performers displayed on the walls of the company headquarters. In a third, it was getting a personal hand-written note from a supervisor with a favorite candy bar attached to it. In comparison to the investment these organizations were spending on their actual change initiatives, these costs were quite minimal. But…each one was powerful and from the Frame of Reference of the recipient. Whatever works has always been our motto! In today’s business world where change is a constant, Reinforcement is the control switch for getting sustained adoption for your change. 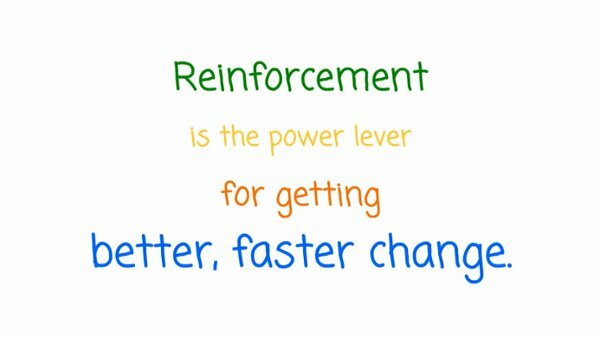 If you don’t change the Reinforcement, you don’t get the behavior change. And if you don’t get behavior change, you won’t achieve implementation success! It’s just that simple.